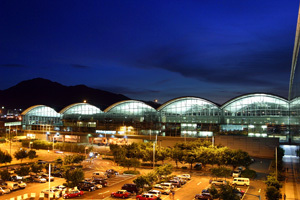 A night view of Hong Kong's Chek Lap Kok airport on a wonderfully clear summers evening. The spotting community in Hong Kong has steadily grown, and some of the member's photographs can be seen through the online aviation photography websites airliners.net and jetphotos.net. The Hong Kong Spotting Forum is the place where you will find most of the community. Please feel free to drop in and have a look around; any photographers/spotters/aviation enthusiasts are gladly welcomed, no matter age, experience or location. We have members from South America, Europe, Australia and Asia. We have lawyers, pilots, airport ground staff, post office workers and accountants as well as a myriad of other professions, with one thing in common... an interest in aviation. This is all adding to the diverse knowledge base and topics discussed! Interested? Then please pop in!